What are the benefits of outsourcing global relocation programs? For clients, there are many benefits to outsourcing this strategic function. Most clients learn they do not have the requisite knowledge and experience to effectively manage global relocation with in-house resources. Outsourcing this critical activity provides them access to the industry’s best practices and thought leadership that will help their company’s global relocation program achieve success with virtually all relocation assignments. For most clients, managing relocation costs is one of the most important reasons driving their choice to outsource relocation. 71% of companies that manage relocation in-house are not aware of their full internal operating costs. Lack of knowledge on the true costs of relocation prevents the company from understanding how to efficiently utilize resources. They also are not able to gain the most benefit from their global relocation program. A solution that provides full expense tracking and reporting is one of the top features clients seek as they consider outsourcing their global relocation program, so costs can be fully identified and reviewed for budgetary impact and program performance. Outsourcing global relocation programs should provide clients with the ability to obtain greater cost savings. Some Relocation Management Companies (RMCs) are not independent. As a result, they often do not seek multiple bids for household goods shipments and other services. An independent RMC provides clients with several opportunities to receive and review bids on services, and this helps keep costs lower than other RMCs that don’t seek competitive bids. Transferees and their families often have many questions related to tax issues, visa applications, and other reporting requirements related to their global relocation assignment. To avoid putting the client’s company at risk for providing incorrect or insufficient guidance and advice, outsourcing global relocation programs can provide expert guidance on unique relocation needs to help transferees find the right solution, and help clients avoid any risks related to transferee requests. In-house programs do not often provide enhancements such as pre-decision tools, candidate assessments, auto lease programs, home purchase programs, and other value added services. Choosing to outsource a global relocation program provides access to these services. These relocation program enhancements are highly valued by transferees and their families. Additional valued services include community tours, language training, outplacement services, school reports, and moving cost estimates. Outsourcing global relocation programs lets human resources, compensation, benefits, and recruiting professionals focus on their core competencies. As a result, they can provide the best service in these business areas. In turn, experts at an RMC provide the best service for the client’s global relocation program. Choosing an RMC with the knowledge and experience to manage their entire program provides peace of mind and assurance that costs will be managed effectively, relocations will be successful, and transferees and their families will be satisfied with their experiences. Outsourcing your global relocation program to a qualified RMC provides a number of distinct benefits. Both your company and your relocating employees gain many highly valued services and enhancements. 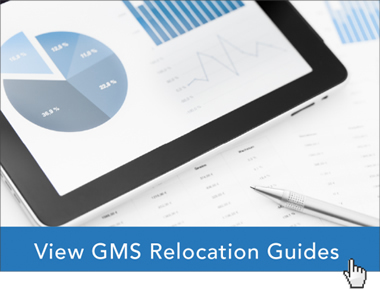 The global relocation experts at Global Mobility Solutions (GMS) have the knowledge and expertise to help your company gain the most benefits from outsourcing its global relocation program.